Chicken & Waffles Cake + my blog birthday! Football and I don't really have the best of relationships. People never believe me when I tell them that I was quite the sporty child growing up. For years, I bounced back and forth between different sports — I played basketball throughout my childhood, embarrassed my entire family by routinely missing the tee-ball in front of me, and was even on the soccer team until I started high school. Don't get me wrong, I wasn't the best in any of these. (Really though, are you surprised? I was definitely definitely more of the theatre and dance and baking cookies in the kitchen for the team sorta boy. 💃) But football? That was of the bleakest moments in my timeline. After my failed attempt at fourth grade flag football, I decided I'd had enough. I mean, seriously, I didn't even know what a down was. Actually, I still don't. Today, I usually just spend football season listening to my dad scream at the television and act like I know what's going on when all I can see is a bunch of little men zigzagging their way across a field of fake grass. Fourth grade drama and total stupidity aside, I love football season for the weekly parties we throw at my house. Each week, my mom and I light up the grill, preheat the oven and create a full spread inspired by the local cuisine of whichever team we're playing against. Unsurprisingly, I'm always in charge of the dessert. Though fan rivalry is the name of the game during football season, food is what brings fans together. All month long, bloggers are teaming up with Kingsford Charcoal to bring you the biggest virtual football party ever. True to form, I've nominated myself for the coveted dessert duty. Since I'm from New Orleans, I'm repping the Saints in true black and gold fashion with these grilled bananas fosters sundaes. Honey glazed bananas, topped with creole cream cheese ice cream, bourbon whipped cream, bananas foster sauce, pecans and even edible gold. Touchdown. Using a paring knife, slice the bananas in half lengthwise. Coat each banana piece with honey, then sprinkle with cinnamon and sugar. Let sit for 5 minutes. On your charcoal grill, place the bananas cut side down and cook for 5 minutes. Flip the bananas over and cook the other side for 2 minutes. Serve immediately with bananas foster sauce and other toppings. In a small sauce pan over medium heat, melt the butter until completely melted. Stir in the brown sugar and bananas. Cook until caramelized, about 2-3 minutes. Add rum and using a grill lighter, flambé the sauce. Cook until the flame goes out, then remove from heat and set aside. In the bowl of a stand mixer fitted with the whisk attachment, beat the heavy whipping cream, powdered sugar, bourbon and vanilla on medium-high speed until soft peaks form. Top the bananas with bananas foster sauce, ice cream, whipped cream, pecans and edible gold leaf. This post was sponsored by Kingsford Charcoal. All opinions are my own. 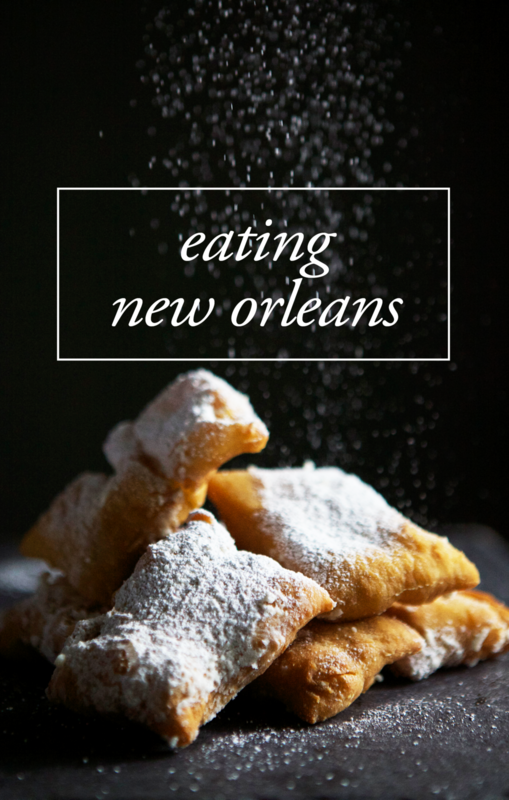 I personally believe that calories don't exist in New Orleans, so I like to treat myself to a cafe au lait and an order of beignets with extra powdered sugar at my favorite beignet spot, the original Cafe du Monde in Jackson Square. the quintessential City Park picnic: meats and cheeses from St. James Cheese Company, an overflow of freshly-baked breads from La Boulangerie, colorful macarons from Sucre and iced French Market Coffee French Roast. if you're looking for the perfect mid-day pick me up before going out for cocktails, Domenica's affogato with Chef Lisa White's famed chocolate espresso cookies — bruto ma buoni — hits the spot every. single. time. To say that New Orleans is a special place is an understatement. Every square foot of this perfectly imperfect city overflows with character. I grew up in a small town less than an hour north of the city, but never truly discovered my love for the city until the day I left it. It’s a bit of a paradox really, because placing yourself in New Orleans often seems like removing yourself from the outside world. Time goes slowly here and things don’t always get done on time, but that laissez-faire attitude is exactly what makes New Orleans so beautiful. From the colorful Caribbean houses of the French Quarter to the melange of cultures visible on each and every street corner. The food. Hell, how I love the food. The fact that it’s perfectly acceptable to have a full-fledged powdered sugar fight over a hot cup of our amazing chicory coffee. The need to celebrate anything and everything to the openness and hospitality of complete strangers. The reasons for my love are endless. Thank you to French Market Coffee for letting me share my perspective on New Orleans! Check out what other NOLA bloggers have been sharing by searching #mynolamycoffee on Instagram.